Neil Young News: Neil Young Archives: "Huge drop of unreleased tracks!" As we reported here on TW recently, the Neil Young Archives (NYA) will continue to be free until issues with European regulations are resolved. In the meantime, Neil Young has stated that there will be "Huge drop of unreleased tracks!" 15 tracks will be dropped onto the Timeline, but not be associated with an official album release. The tracks will appear once the paid subscription model is in place. The tracks are from the 1976 solo acoustic tour that ended just before the Last Waltz, November 1976. 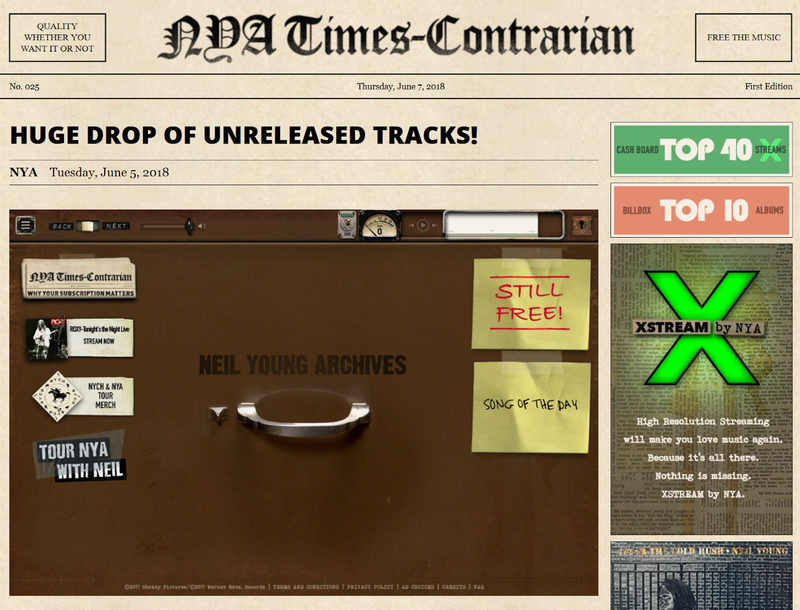 More on Neil Young Archives (NYA) Times-Contrarian. 1976 Solo acoustic tour ???? Hmmm...... probably more like "from the opening acoustic sets of the 1976 Crazy Horse tours or Europe, Japan and the US"
Something like the notorious "Bernstein Tape" bootleg ? Must be culled from the Bernstein Tapes...surely. Exciting! No doubt in my mind whether to subscribe or not. Guess that was Neil's aim. This is great. Eventually this will be a physical release. I’d rather NY have the online archives and release a physical album every once in a while. Easy to afford compared to the behemoth that is the physical Archives. I really don’t care anymore for NYA2. This is the cheapest and best way to get the Archives out for NY. He’s happy and I’m happy. Looking forward to hearing this. His acoustic material has a certain spirit to it. The thing I'm most looking forward to is the Crazy Horse Early Daze album, Toast, and (if he ever releases it) the original Tonight's The Night acetate. Does this mean an official release of Neil rambling about Judy Garland? One can only hope so! So must be sourced from the U.S. tour in late 1976 given the clues and my money is on the Joel Bernstein tape, too. Would like to hear the Stills/Young recordings at some point from that year. P.S. Remember the "E" and "L" codes on the tape? The solo acoustic songs from these 1976 Crazy Horse tours do have a certain vibe not found on any other live solo recordings. I just hope they don’t find a reason to exclude The Losing End from the lot. Some of the very choicest solo cuts come from the Stills-Young tour too. I would be very happy if a few of those found their way onto this set. Esoterically speaking: the posting about the Huge Drop is signed by NYA -- the archivist, I guess -- and not Neil himself. And the hyperbolic descriptor fits right in with the verbosity we're becoming accustomed to in the USA these days. maybe its the rock of blow Scorsese had to remove from his nose. Ive always wanted to see that. I know this is off topic, but I've recently discovered some live footage of Neil and the Horse live at The Marquee in Cork Ireland. It's got a very different vibe than I'm used to from Neil and I've been watching it obsessively. Especially Days that Used to be. This is around the time of Neil and Pegi's split. He just seems angry or high or something but it's just a very intense and amazing performance.Has anyone else seen this? Your thoughts? Does anyone know where I can find video of the whole performance? Right on Jim!! That is definitely the Holy Grail of Holy Grail's for me. I've been hoping for NYAPS Vol 1.5. Has to be the ultimate early years setlist. Anyway, this new live drop certainly has be believing a Canterbury House 1969 drop could be possible. Also I do believe it is all acoustic guitar, I think Neil first uses the piano live at the Cellar Door in 1970. Hey, what's happened to Movie Night on NYA? Wasn't the day today ? I haven’t seen the video but there was a great vibe at that show. Really powerful performance. I just want Neil to Harvest(pun intended) as much as possible the gold mine that is his '70s music. Just like with Hitchhiker and Roxy there is so much of his work in that period that is so untouched. No other decade comes close.